Pulitzer Prize-winning journalist, best-selling author and influential American public thinker Thomas Friedman wowed audiences in Wellington and Auckland during his busy visit to New Zealand in March as a John F. Kennedy Memorial Fellow, awarded by Fulbright New Zealand. Thomas Friedman gave the closing keynote address for the New Zealand International Arts Festival’s Writers and Readers Week at the Wellington Town Hall on 14 March, speaking on the theme of his latest book That Used to be Us: How America Fell Behind in the World It Invented and How We Can Come Back. An audience of around 1,300 included past and present New Zealand prime ministers, cabinet ministers and ambassadors. A cocktail reception was held immediately following his Town Hall Talk to formally welcome and recognise Friedman as a John F. Kennedy Memorial Fellow, at which Hon Tim Groser, the New Zealand government’s Minister of both Trade and Climate Change Issues (two topics regularly discussed in Friedman’s New York Times column), and Marie Damour, Deputy Chief of Mission at the US Embassy, spoke on behalf of their respective governments. 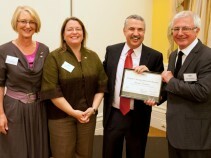 Friedman’s other activities in Wellington included a face-to-face meeting with Minister Groser and a breakfast roundtable meeting hosted by the New Zealand Climate Change Research Institute for 20 different government and non-government representatives. In Auckland, a dinner was held at Fulbright New Zealand Board Treasurer Mark Fitz-Gerald’s residence, attended by Deputy Prime Minister Bill English along with a small number of influential New Zealanders. 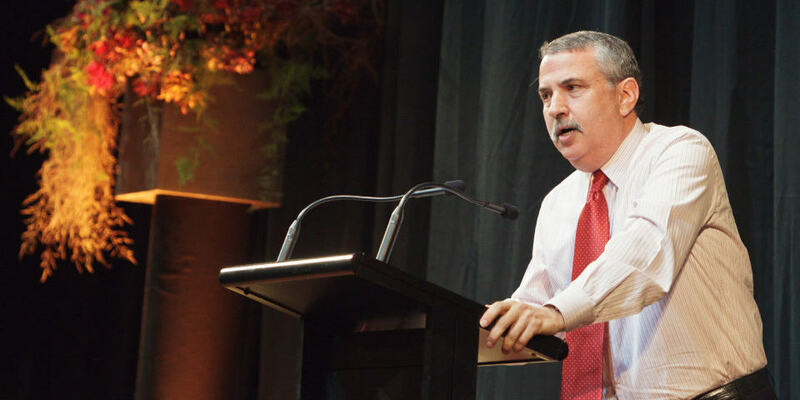 Friedman spoke again on the decline of America at a free public lecture at AUT University, with over 300 people in attendance.